The WHALEN-JACK Post Pocket provides fall protection at elevated floor levels, staircases and roof lines Giving you and your workers a OSHA acknowledged guardrail/fall protection system at any working level. The WHALEN-JACK Post Pocket should be attached with four 2-inch x 1/4- inch lag screws. The WHALEN-JACK Post Pocket can be attached to sub floor or exterior rim joist, providing an OSHA acknowledged fall protection system at all elevated floors. 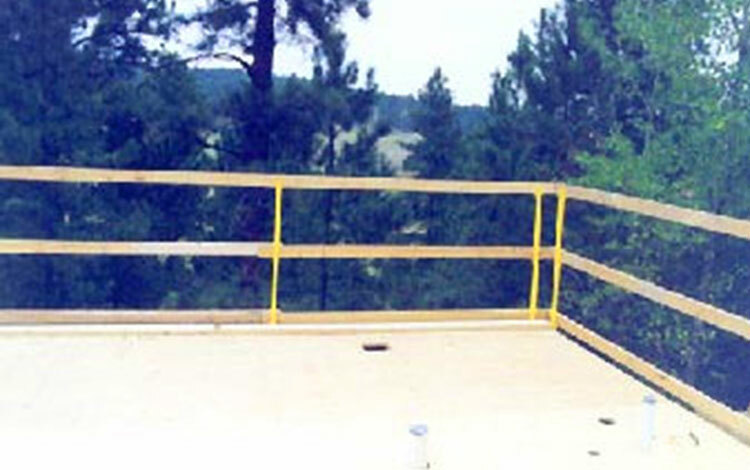 The WHALEN-JACK Guardrail/Fall Protection System is completed with 2x4 handrails. 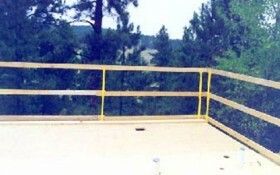 Giving you and your workers an OSHA acknowledged guardrail/fall protection system at any height. Ensure that the proposed site is clean, debris-free, and devoid of any damage which would compromise the strength of the receiver. Please consult with a Foreman or Superintendent if there are any questions regarding what constitutes a safe work area. If using 2×4 rails, allow for a minimum of 12″ of overlap and consider screwing or nailing the ends together to prevent weak spots. 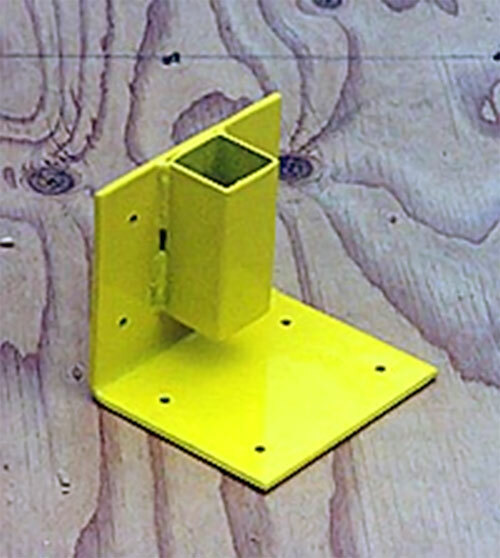 Rim Joist Attachment: Four (4) lag screws in vertical flange of post pocket bracket. Subfloor Attachment: Four (4) lag screws in horizontal flange of post pocket bracket. Exterior stringer attachment: Four (4) lag screws in vertical flange of post pocket bracket. Top Of Stair Tread Attachment: Four (4) lag screws in horizontal flange of post pocket bracket. 3. Once post pockets are securely attached, install handrail into post pocket and secure with pin. 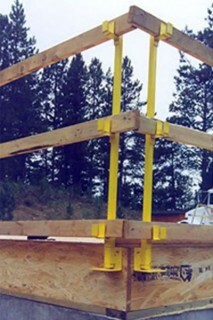 Guardrails (2x4s) can now be installed and secured in position. To disassemble and reuse this system, simply pull down rails, remove posts, then back out lags and take down hand rail bracket. Always inspect parts for damage and excessive wear before storing or reusing. For any installation questions, contact your Foreman or site Superintendent.